How Long Can the Fed Continue to Downplay Inflation? 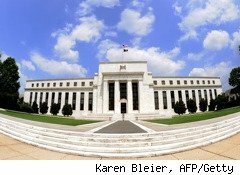 When the Federal Reserve's interest-rate-setting committee meets on Tuesday to consider whether to change its monetary policy, it will likely be forced to alter the way it views the economy. It will probably rewrite its dismal assessment of unemployment, which has fallen, and acknowledge that the economy seems to be picking up. But will it also admit that the whiff of inflation is much stronger? Prices for food and gasoline have lept in recent months, but they are not part of the key measure known as "core inflation," so the Fed tends to play down their impact. In his recent Congressional testimony, Fed Chairman Ben Bernanke said "the recent rise in commodity prices will lead to, at most, a temporary and relatively modest increase in U.S. consumer price inflation." Tell that to Bill Dudley, president of the New York Federal Reserve Bank, who was lambasted by a crowd in New York last week and angrily asked when he's last gone shopping. In fact, the University of Michigan consumer confidence survey released on Friday shocked many economists. It said one-year inflation expectations had surged form 3.4% at the end of February to 4.6% in March. "Bernanke has been saying inflation expectations are still falling, but they are absolutely not," says Rob Carnell, chief international economist at ING bank. "It is just not appropriate to have a super accommodative monetary policy when the economy is growing and inflation numbers are moving up." There's no doubt that the economy is growing stronger, as reflected by the latest retails-sales report on Friday. Retail spending grew 1% in February, with auto sales -- which increased 2.3% -- providing the biggest boost, increasing 2.3% in the month. Unemployment has declined to 8.9%, representing a drop of a full percent in only three months. The employment component of the ISM manufacturing index in February reached its highest level since 1973. As a result of these improvements, the Fed is going to have to revise the glum outlook it gave at its last meeting in January, according to Troy Davig, senior U.S. economist for Barclays Capital. "It's getting to the point where they are going to have to start changing their assessment and acknowledge some firming in consumer spending," Davig says. He added that the employment picture also has been improving rapidly, with the so-called diffusion index showing that companies are hiring more workers than they are laying off. Both Davig and Carnell say they don't expect the Fed to change its existing zero-percent-interest-rate policy or to step back from its economic-stimulus program of buying $600 billion of Treasury bonds -- even though it adopted that policy when things looked much glummer. The U.S. policy contrasts sharply with Europe's, which has warned it may start raising interest rates next month to stave off its inflation problem. The news has caused a huge realignment in currency rates, with the euro surging and the dollar falling. Should the Fed End QE2? Carnell claims the U.S. bond-buying program, known as quantitative easing, is doing as much harm as good and should end before its scheduled stop in June. "It's an irrelevant policy that's causing all sorts of distortions," he says, noting that it has caused a huge bout of inflation in places such as Brazil and China as investor funds leave the U.S. in search of higher returns. But, reading between the lines, the Fed seems determined to continue with quantitative easing for the next few months, despite the economy's pickup, Davig says. What remains unclear is what Bernanke plans to do with another program, announced last August, that calls for the Fed to use the interest it makes from the bonds it owns to buy new Treasuries, further stimulating the economy. "What's going to happen to the reinvestment is less clear," Davig says, "A natural thing to do is freeze it." At least if Bernanke rewrites his outlook, American consumers and companies will have a better fix on where things stand. That will help them make better spending decisions in the next few months.